Curved counter with 8 compartments and flush-mounted acrylic writing top. It has a curved pedestal and black feature strip. Finished on all 4 sides, comes fully assembled and is available in 7 finishes: cherry, golden oak, walnut, light oak, colonial, red mahonagy and black (shown in golden oak). 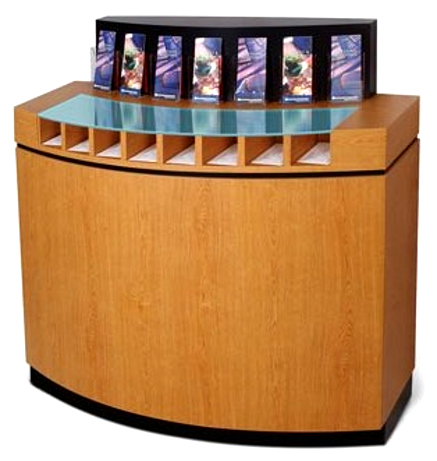 Dimensions: 42" H x 48" W x 21" D. Curved 7-pocket literature dispenser (pictured) is optional. Curved counter with 8 compartments, flush-mounted acylic writing top. Choice of 7 finishes. Optional 7-pocket lit. dispenser.